Kim Stanley Robinson is one of SF's most acclaimed authors, and with good reason. His novels and stories are passionate, eloquent, deeply intelligent and informed; they have comprehensively expanded SF's capability to understand - and so describe - the relationship between human beings and their physical environment, surely the genre's quintessential thematic territory. In doing this, they have challenged the right-wing technophilic attitudes of traditional American SF, shifting Hard SF's ideological centre sharply and bracingly leftwards. The literary result is an oeuvre of endless depth and fascination, as compellingly argued as it is magnificently described and characterized. More than two decades into his career as a writer of fiction, Robinson has to date produced nine novels and five story collections. Of the novels, The Wild Shore (1984), The Gold Coast (1988), and Pacific Edge (1990), make up the intersecting miscellany of alternate futures known as the Three Californias trilogy; two early titles, Icehenge (1984) and The Memory of Whiteness (1985) develop the lineaments of a human-colonized Solar System that is rendered in revised and deepened form in the vast, utopian Mars trilogy, consisting of Red Mars (1992), Green Mars (1993), and Blue Mars (1996). Antarctica (1997) complements the Mars novels with its examination of near-future environmental and economic options. Robinson's collections show a great versatility of range. While the connected novellas in Escape from Kathmandu (1989) deal amusingly with Himalayan mountaineers and their encounters with the marvellous, The Martians (1999) illumines and recomplicates the materials of the Mars trilogy. And the volumes that assemble self-contained stories - The Planet on the Table (1986), Remaking History (1991), and Down and Out in the Year 2000 (1992), the last two of which substantially overlap - explore subjects including the mathematics of blindness, the convergence of histories, the return of the Ice Ages, and the sinking of Venice. But however varied, they - and the novels - are united by a consistently impassioned, incisive, humane narrative voice, the persuasive reasoning voice of a builder of living and livable utopias. When I interviewed Stan Robinson by e-mail in September 1999, I was eager to discuss the foundations of his literary vision, and the formidable architecture of ecology, psychology, ideas, and ideals he has erected on them. Very kindly, he obliged my curiosity. NG: What originally attracted you to Science Fiction? And (stemming from this) which SF writers do you particularly admire, and do you consider any to be especial influences on your own work? KSR: There's a story I tell, in which I grew up in an agricultural community reading Mark Twain, then watched the orchards ripped out and replaced by a freeway/condominium nightmare, and shortly thereafter ran across New Wave science fiction, and recognized it as The Truth about my world. But the real truth is, I don't know what attracted me to sf. It just happened. I particularly admire the New Wave-era sf writers I began with, especially Wolfe, Le Guin, Delany, Russ, Lem, the Strugatskis. I don't think of any of them as special influences on my work (that would be an impertinence), but still read them all very closely and with great pleasure as their new books come out. NG: I'm interested to see you mention Gene Wolfe as a favourite writer, because in my view - and I think many hold this opinion - you and Wolfe are the two finest contemporary SF writers. What do you see as his particular contribution to SF? KSR: Well it would be hard to particularize, he has contributed so much. In short, greatness. He is similar to the great modernist masters of the first half of the century, people like Stevens or Proust or Woolf, in that he has a very powerful personal vision, and great moral complexity and intensity, expressed in beautiful prose and surreal imagery, in many superb stories and novels. We in the sf community can point to his work as evidence that science fiction is capable of achieving all that modernism ever hoped for literature, and then some, in that he plots better than most of the modernists. As for specifically science fictional contributions, the working knowledge of technology and society given to him by his editing job at Plant Engineering allowed him to be sophisticated and authoritative when he introduced scientific elements into his work. At the same time there is a dreamlike quality to much of his writing, in its boldness and strangeness, and seeming inevitability. This combination of gifts allowed him the greatest achievement in science fantasy, in his Sun masterpieces. NG: Even though you've consistently written SF (and, occasionally, fantasies like "Black Air" and "A Short, Sharp Shock"), your works have a definite "mainstream" feel to them, for example in their extremely careful attention to characterization. Are there identifiable non-genre literary models for your writing? KSR: Just the novel itself, I suppose. It's novels I love, more than any particular subject matter. I've read with pleasure in the whole history of the novel in English, and enjoyed many in translation from other languages. Novelists I admire very much include Albert Camus, Alejo Carpentier, Joyce Cary, Joseph Conrad, Lawrence Durrell, John Fowles, Garcia Marquez, Cecelia Holland, Peter Matthiessen, Patrick O'Brian, Marcel Proust, Thomas Pynchon, and Virginia Woolf, among many others. I also love to read poetry, and admire among others Stevens, Snyder, Merwin, Rexroth, Walcott, and Chinese poetry in translation. NG: Of course, while we're talking about influences, the outdoor--the environment, the wilderness--is a pervasive presence in your fiction. Your characters are often mountaineers, hikers, tour guides, human types you seem to know very well, even having lampooned them to a degree in Escape from Kathmandu. Can you say something about this element of your writing? KSR: Well, I like to spend time in the mountains, that's the main thing. I wanted to get that important element of my life into my fiction. And I've seen the trekking scene in Nepal and Antarctica, and that's a good entry point for comedy, also for our relationship to the physical world, etc. It struck me early on that there was an opportunity here, in that historically sf had been an urban literature, but the future was going to include as a crucial element the story of our relationship to the planet. So sf stories about this were not numerous, only Le Guin seemed really in tune to it, and yet they were needed to round out the genre and make it include environmentalist concerns. NG: Still on the theme of the environment, but returning to my earlier remark about your gift for characterization: your characters often have a very intimate relationship with landscape, shaping it and being shaped by it. One might even venture that on some level they are their environment. Can you comment on this technique of yours? Yes, I'm very interested in place and its effect on people; how some people have a strong sense of home and place, while others don't, etc. For me it's always mattered intensely where I live. I grew up on a coastline in a Mediterranean climate, and have now lived in several different places, and each one has had a big impact on me. That deserves to be written about. Sf's historical tendency to be set in imaginary spaces, often indoors, in cities or spaceships, has never interested me much; I want to write about what it feels like to live in a particular place, and I think sf can use that. Novels in general need not give up on landscape as a subject, despite photography, because novels can get so deeply into what it feels like, what it means. NG: From the previous question we move naturally to that of utopia. You are a utopian writer of great consistency and ambition. Starting with background: do you consider SF to be a--perhaps the--naturally utopian genre? KSR: Darko Suvin has written that utopia is a subgenre of science fiction, which, historical questions aside, seems right to me. Then in our century we've seen the rise of the utopian novel, a mixed genre which I would characterize as a novel describing characters in some utopian space. This gives the utopia a story and characters, so that it is interesting enough to read, while it gives the novel some very interesting new content, and the chance to make explicit its political program. Morris, Bellamy and Wells began this, Graves and Huxley continued the development, and Le Guin brought it all into focus with The Dispossessed. NG: Which other contemporary SF writers do you consider to be especially utopian in preoccupation? Would you say that there are opposing utopian schools--say, left-wing and right-wing ones--in the wider SF community? KSR: I think of Le Guin as the other contemporary sf writer preoccupied with utopia as something to return to more than once. And Mack Reynolds should be recalled. I don't think there are opposing utopian schools in sf, as your question suggests, because I don't think there's any such thing possible as a "right-wing utopia." Right-wing politics by definition tries to prevent or reverse change; for it the current feudal regime is already "utopia" so there is no need to think utopia as a project. You have to distort the word "utopia" out of all recognition to make it fit any right-wing book; as for instance, "the world would be great if it were run by a junta and had biological communists to fight forever, so Starship Troopers is a right-wing utopian novel." True maybe, but useless. It has to be acknowledged that the expansion of legal rights to more and more people (women, ethnic minorities, children, the disabled, alternative lifestyles)--that is to say, social progress in history, the utopian track of history--has been a left-wing project and a left-wing accomplishment. NG: What, in summary, is your own basic utopian thesis? KSR: We have technical means such that everyone on the planet could have adequate food, water, shelter, clothing, health care and education. But we live in a feudal hierarchy that is not concerned with this project, but rather with feathering the nests of the rich and powerful, and be damned to everyone else. A course of history that leads away from this hierarchy toward a state of sustainable adequacy is utopian from its first step. Because of this, utopian courses of history can only be confirmed retroactively, but we can still work on them now. NG: Your first utopian sequence was the Three Californias trilogy, which presents three markedly different scenarios for the future of California, and, by extension, the world. What are the utopian mechanics of this series? Would it be reasonable to generalize that The Wild Shore moots utopian possibilities in the context of a dystopic post-holocaust setting, and that The Gold Coast and Pacific Edge develop those contrary elements, the dystopian and the utopian respectively? KSR: I thought of the Three Californias trilogy as three alternative futures for the world, using standard sf tropes: after-the-fall, dystopia and utopia respectively. It seemed to me an interesting structure for a trilogy, and still does. NG: The departure point of your work is often the relatively near future, which holds the danger of speculation rapidly becoming obsolete. Speaking from the perspective of the present, with the USSR gone and the dangers of nuclear holocaust and continued superpower arms rivalry rather reduced, do you feel that the Three Californias trilogy's future historical scenarios (atomic warfare, a continued Cold War, etcetera) retain their original thematic force? It's The Gold Coast I feel worst about, because it would only take removing or changing a few sentences and the book would remain quite true to our current moment, because the US military industry is still going full clip, even the anti-missile fraud. Its justification is no longer the Soviet Union but various mid-sized nations, in what could be a long string of real or concocted "bad guys". The Gold Coast suggests this very situation frequently, but highlights the USSR in other places, and so when Tor reprinted the book as part of their Three Californias trade paperback series, I asked them if they would mind me making a few changes to bring it up to date, but they didn't want to bear the cost of it. Too bad, because the book remains immediately relevant while those few sentences about the USSR I find distracting, and irritating given that I wrote the book in 1986. Maybe someday I can make the changes; or, better yet, the world will change, and render the novel completely historical. Strangely, The Wild Shore scenario holds up better, because it has only the USA being unexpectedly bombed by unknown terrorists, somewhat like the recent apartment buildings in Moscow only more so, and this remains a frightening possibility. Even so that book seems to me intrinsically not as germane to our moment as The Gold Coast or Pacific Edge, because nuclear explosions have a kind of unthinkability that make the book a kind of fantasia from the start. Perhaps it is a good thought that Pacific Edge seems to have the scenario with the most solid current relevance. NG: Any creator of utopias invites argument. Eschewing any ideological criticism, I'd like to submit for your commentary a broad conceptual critique of your utopias of the last decade. Repeatedly--in Pacific Edge, the Mars novels, and Antarctica--you set out in detail the operations of non-propertarian, ecologically responsible, economically rational utopian societies. You do so with intense persuasiveness. But how useful are your imagined examples, with their wide open spaces, low population levels, highly qualified citizens, and relative distance from the centres of capitalist power, for a world that is overcrowded, plagued by illiteracy and ignorance, and increasingly dominated throughout by multinational corporations and related structures of power? You do make gestures towards these realities, such as the very urban Oscar Baldarramma's presence in Pacific Edge, and Mars influencing Earth in the Mars trilogy; but are they (and thus the novels) remotely enough? KSR: Enough for what? Enough to change the world? Apparently not. Enough to model possible changes in the world? I hope so. Each novel is different, but all do more than "make gestures" toward the realities of power in our time. Pacific Edge takes place right in the heart of multinational capitalist power, which is Orange County, California (take note). In that novel I tried to suggest a global move toward a more just and sustainable economy/culture, which included all the rest of the world too. It is focused as a novel on my home ground, where I feel I have the most right to speak as a citizen and say "this should change." I don't think I would be comfortable telling the disenfranchised in other countries how to become better citizens and create better societies; quickly that becomes yet another aspect of American imperialism. What I can do is preach in my own country, which after all is the power center of capitalism, and say "even self-interest requires that you share some of your wealth and power, this is actually the best way to make the world safe for your children, not to mention the morally right thing to do," etc., etc. So I think Pacific Edge answers most of the critiques implicit in your question, very directly and consciously. The Mars trilogy is a different case, in that it begins in an empty space, physically and historically, and is occupied first by a small group of highly educated people. But they don't escape capitalist power by that move; they have to fight it, and it is a very long utopian novel, and only really utopian near the end, when the Earth chapter of Blue Mars shows how global changes are taking place in capitalism, that capitalism is mutating or being forced to change into something more just; and that this is being accomplished not by an elite on Mars but by local activists in each country, working on their own particular historical situation. Much of this is related indirectly, but the Trinidad-Tobago scenes try to tell it directly as well, in a kind of case study. Antarctica is even less utopian than the previous two works mentioned, and I did not say in its plot that the whole world could function using the ferals' methods; but I would hope that parts of their ethos would be suggestive for the world at large, so that it might be called a "utopian suggestion" rather than a full utopia, or even a utopian novel. What your question calls for, really, is a near future global utopian novel, set on Earth, with a history that runs clearly and without strategic opacities right back to our moment. A tough assignment to make plausible, sure, but a good idea for a novel nevertheless, and I invite you to write it. I might try writing one myself someday. But if I did I would have to find my novelistic entry point into it. Of course it might be possible to do something like Brunner's Stand On Zanzibar, which is based on the technique of Dos Passos' USA trilogy; in fact Stand On Zanzibar has a sort of utopian element too, in the discovery of the mutant African tribe that gives off peaceful pheromones. Better, of course, would be to do a Stand On Zanzibar with an economic element, a conscious critique of capitalism and a new economic system replacing it. This is a first-rate idea for an sf novel, but, for me, long on the global stuff and short on character focus, and in need of a plot, etc. For that and other reasons I have other projects in mind. NG: The Mars Trilogy, with its eventual moving reconciliation of Green and Red tendencies, seems to be very much concerned (most notably after the Second Revolution has succeeded) with the necessity of moderation, of compromise in matters of rigid conviction. Is this quality essential to utopia? KSR: In my utopia anyway. I'm rigidly insistent on compromise, tolerance and moderation, except of course about certain matters where I suspect you need to stand firm on principle. It's one of those conundrums that any society even approaching utopian conditions is going to have to face. I thought of it as Nadia and Art's contribution to the process. KSR: Well, it began as a companion volume or miscellany, of stories that could not fit into the novel because they concerned different histories for Mars, or did not fit tonally or in other ways. It was all the Mars writing I wanted to do that would not fit in the novel. But as I was writing the stories I found that a miscellany is not a very shapely form, and I didn't like that, I wanted something more out of the collection as a whole work, so I began to think of it as a secret history, or even as a kind of struggle between various histories for dominance, so that all the individual stories would tell this larger hidden story (like some kind of Asimov or Leiber time war) without knowing they were telling it or even that it was going on. It gave me ways to organize and sequence the material, and new things to say, and I had a good time with this "understory" as I called it, though in the end it is buried too deep, and doesn't make entire rational sense. To tell the truth, a lot of my thinking about the book was clarified after the fact by your review of it [forthcoming in The New York Review Of Sf - NG]. I understood it better then. NG: Have you encountered Brian Aldiss' White Mars as yet - as I understand it, a reaction to your Mars novels by another left-wing utopian writer? KSR: I encountered Aldiss himself at a recent convention and he described the story of his Mars novel to me, and it sounded unlike my novel, and unlikely to be a response to my novel, as I do not think he has read my work. Which is fine, I never read any of the other Mars novels of the 80s and 90s myself, except for Frederick Turner's epic poem "Genesis" after I was well into Green Mars. It's a big planet, and there's room for lots of stories to be set there, and there always will be. NG: Alongside your utopian theme, and interacting with it, as in The Martians, is your emphasis on history: historical causation and process, how these work, how they can be guided (in a utopian direction, of course). You've even defined SF by reference to its relationship with history. Can you restate that definition here? KSR: Maybe. I think science fiction is an historical genre, in that it takes place in our future. That is to say, from the fictional world of the novel you can follow its history back to us (or some moment of our past, in the case of the alternative history). The fictional history is related either explicitly or implicitly. If no history can be traced back, it may be some kind of fantasy novel, or something else, but it isn't science fiction as I recognize it. This definition is somewhat redundant to the obvious one of "science fiction takes place in the future", but it helps in some cases to clarify the science fiction/fantasy boundary, and explains sub-genres like the alternative history, which otherwise are not obvious in their connection to sf set in the future. NG: A continuity in your work has been your Mars-related future history, which you employed in early versions in Icehenge, The Memory of Whiteness, "Green Mars", and elsewhere, and then refined and built upon in the Mars trilogy. How did you conceive this future history, and how have you reshaped it over time? Does it represent an evolving historical thesis, a general modelling of the operations of history? KSR: No, I don't think of those works as existing in the same future. They have different timelines, different technologies, different histories. They only have Mars in common. When writing them I decided early on against trying to rope them into a single future history. In general I don't like the idea of a writer fitting all his works into a single fictional history. It sacrifices new thinking to a generally unimportant consistency. In each of my works that has history as one of its subjects, I've tried to suggest some ideas of how history operates. But this is something everyone mulls over all their life long. NG: Turning from future to alternate history: some of your most memorable short stories are alternate histories; the Three Californias books occupy alternate futures; you're now busy on a full-blown counterfactual novel, A World Without Europe. How do you regard the wider alternate history subgenre, and how useful do you think its techniques are (for example in your own hands) as instruments for examining the realities of "actual" history? KSR: Well, it's an interesting question, which I'm only exploring in full now, and in the coming year. It seems to me there might be some value to the alternative history, in reminding us that our own history has never been preordained, and could have come out differently. It's also a way of interrogating the roles individuals might play in history. But there's a danger in the method too, in that readers always know that it didn't happen this way; so it can seem a game. By and large I would say science fiction proper has a stronger stance, which is "this is going to happen to us!" when alternative history can only say "this didn't happen to us, but it would have been interesting," which cannot strike with the same force. Future tense is more striking than the subjunctive, perhaps. But despite these concerns, it could well be that both forms offer equally great opportunities for a novel as novel. NG: There is a rather stale but perhaps still pertinent argument concerning the differences between Cyberpunks and Humanists in SF. While the Cyberpunks emphasize the human-machine interface and its resulting (often solipsistic) opportunities and alienations, you maintain a liberating focus on the relationships between the human and the natural, the individual and the social. In your work, humans remain human, governing technology, not governed by it. Is this summary basically accurate? Even if the Humanist/Cyberpunk dichotomy is simplistic and overplayed, do you see yourself as engaged in a continuing debate with the Cyberpunks (or post-Cyberpunks), perhaps over the direction progressive Hard SF should take? KSR: I like your characterization of the divide between my work and cyberpunk, because we do control technology, in the sense that we are responsible collectively for what we do. But I do feel the cyberpunk issue is dead now. I mean I would still insist that the outdoors is more interesting than the indoors and the virtual, so that in sheerly novelistic terms I found the right space to work in. But that's just my feeling about it. Others are free to work in other spaces. The truth is that between writing, research, parenting and life in general, I have no time anymore to read other sf writers, and seldom do. I'm even beginning to feel that it's part of my job to remain ignorant of current sf, and to become increasingly idiosyncratic. That's what novelists are supposed to do. So I read the sf writers I enjoy to the point that I wouldn't want to deny myself the pleasure of their work, but nothing else. I think I get the cream anyway, so it's not a problem. But as a result I don't know what the cyberpunks or post-cyberpunks are writing. I never did. You must remember that whole dichotomy was not serious analysis, but mere mischief-making. There was never any such thing as "humanist sf," and I would reject the label now, and any other content label as well. "Science fiction" is enough, both narrow enough (please, no "progressive hard sf"), and broad enough to be of use. I am a science fiction writer, very happy to be one, and no other adjectives wanted. NG: Can you say something about the scenario and plot of the novel you're currently writing, A World Without Europe? KSR: Oh dear me no. The title says too much already! NG: The final questions, then: how is work going on A World Without Europe? And are any other projects, for example short stories beyond those in The Martians, in prospect? KSR: There will be no other short stories besides the ones in The Martians. Work is going well on the new novel. What I like is being deep into a novel, with no memory of beginning and no expectation of ending. That's where I am now. fiction - A History of the Twentieth Century, with Illustrations by Kim Stanley Robinson. nonfiction - Antarctica and Short, Sharp Shock reviewed by Nick Gifford; The Martians reviewed by Keith Brooke; more interviews and features by Nick Gevers. features - about Kim Stanley Robinson. Kim Stanley Robinson at Amazon (US) and at the Internet Bookshop (UK). 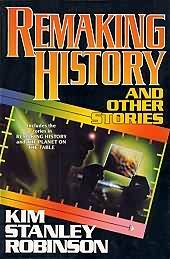 SF Site provides an annotated Kim Stanley Robinson reading list. Over at Science Fiction Weekly, Kim Stanley Robinson answers readers' questions. The Kim Stanley Robinson Fan Page. Kim Stanley Robinson's ISFDB bibliography. Many of Nick Gevers' reviews are online at Parsec.